Perennial. Culms rambling; robust; 100-200 cm long; without nodal roots, or rooting from lower nodes. 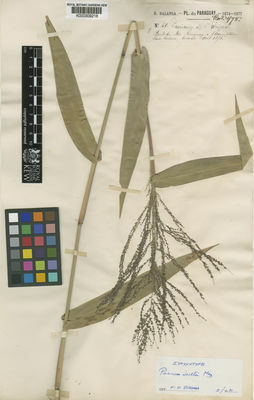 Culm-internodes terete; 4-20 cm long. Culm-nodes purple; glabrous. Leaf-sheaths 3.5-10 cm long; glabrous on surface, or pilose; outer margin hairy. Ligule a ciliolate membrane; 0.3-0.7 mm long. Leaf-blade base amplexicaul; with a brief petiole-like connection to sheath. Leaf-blades lanceolate, or ovate; 7-26 cm long; 10-30 mm wide. Leaf-blade venation with obscure cross veins. Leaf-blade surface glabrous, or pubescent; hairy on both sides. Leaf-blade margins ciliate; hairy at base. Leaf-blade apex attenuate. Inflorescence a panicle; exserted, or embraced at base by subtending leaf. Panicle open; ovate; 10-32 cm long; 4.5-17.5 cm wide; contracted about secondary branches. Primary panicle branches ascending, or spreading. Panicle axis scabrous. Panicle branches secund; scabrous; pubescent in axils. Spikelets in pairs. Fertile spikelets pedicelled. Pedicels 0.5-1.3 mm long. Spikelets comprising 1 basal sterile florets; 1 fertile florets; without rhachilla extension. Spikelets elliptic; dorsally compressed; 1.4-1.7 mm long; falling entire. Glumes dissimilar; reaching apex of florets; thinner than fertile lemma. Lower glume ovate; clasping; 0.7-1 mm long; 0.33-0.5 length of spikelet; membranous; without keels; 3 -veined. Lower glume primary vein scabrous. Lower glume apex acute. Upper glume elliptic; 1-1.7 mm long; 0.9-1 length of spikelet; membranous; without keels; 3 -veined. Upper glume surface glabrous, or hispidulous. Upper glume apex obtuse. Basal sterile florets male, or barren; with palea. Lemma of lower sterile floret similar to upper glume; elliptic; 1 length of spikelet; membranous; 5 -veined; glabrous, or hispidulous; acute. Palea of lower sterile floret 0.75 length of lemma. Fertile lemma elliptic; dorsally compressed; 1-1.4 mm long; 0.4-0.6 mm wide; indurate; without keel. Lemma margins involute. Lemma apex acute; scabrous. Palea embraced by lemma; involute; indurate. Caryopsis ellipsoid; 0.9 mm long. Embryo 0.4-0.5 length of caryopsis. Hilum punctiform. North America: Mexico. South America: Mesoamericana, northern South America, western South America, Brazil, and southern South America. 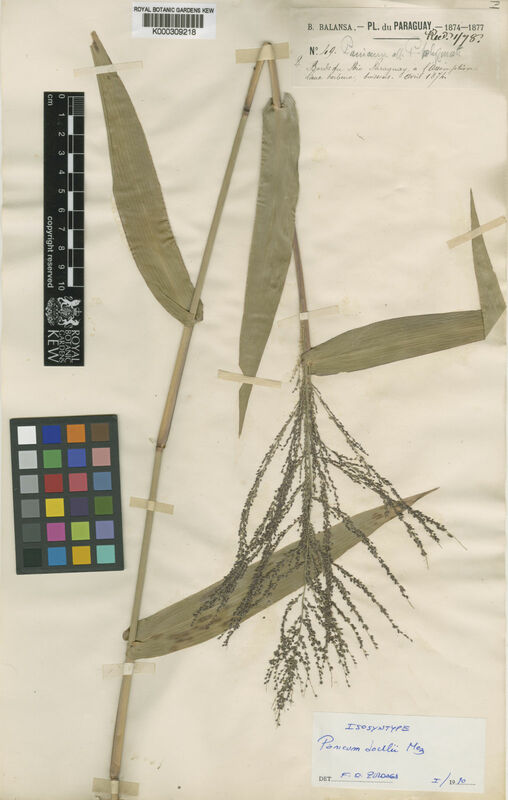 Panicum laxum var. amplissimum Hack.